For me, Christmas is about being together with my family, sharing in our traditions, eating amazing food, seeing all of the kids’ excitement and feeling the love of each moment is what this holiday is truly about. This year the pressure is on because I’m hosting Christmas for my family for the first time! I’ve been on the phone my family to see what I should put on the menu for our Christmas Brunch. Christmas Day is always a brunch day. I mean, who’s going to stop to eat breakfast before playing with all those new toys?! It’s times like these when I can REALLY see the benefits of having the same traditional meal every time, but in my family, we change up the menu at Christmas time pretty much every year (pros and cons people). Christmas morning will already be busy and with Christmas falling on a Sunday, (which means we’ll be adding Church to the mix of festivities) I needed an easy brunch idea that would be A. Easy to make (and still look like some effort went into making it) and B. Comforting and delicious. After all, it is Christmas. After getting everyone’s input, I decided to go with a family favorite: waffles. Waffles are like the fancy cousins of pancakes and they aren’t even hard to make. Plus each person can top their own and it’s less for me to worry about. In an effort to make things more festive. I decided to incorporate oranges (another Christmas tradition) into the waffle and syrup recipes, which I hadn’t ever done before. I used real oranges and incorporated Simply Orange Juice in my syrup recipe (and also serving it to drink) because it tastes delicious, it’s not-from-concentrate or never concentrated, non-GMO, never sweetened and never frozen. You’ll definitely want to keep reading because both recipes turned out so well that I am planning on adding these both to my brunch menu for Christmas! Here’s a little sneak peek… But before I get into the recipes I wanted to share my tablescape for this year. I carried the color scheme of silver and light blue from my Christmas tree to my dining table tying in a similar look and feel. The mercury glass, hints of light blue with the touches of silver and gold make it feel elegant and festive without being so red and green in your face. Now, back to the recipes… I’m proud to share my new favorite waffle and syrup recipes made with Simply Orange Juice. Place waffle mix into a large mixing bowl. Add in the cold water. Place the sugar into a small saucepan, trying to keep it in the middle. Pour in the orange juice around the outsides of the saucepan, then over the top of the sugar to fully submerge. Cook on high heat for 2-3 minutes before stirring. Slowly scrape the bottom of the pan to make sure the sugar crystals are completely dissolved. Allow the orange syrup to reduce for an additional 7-10 minutes on medium heat until it thickens. The consistency should resemble maple syrup, as it will thicken more as it cools. Once cool, serve on waffles with fresh whipped cream and fresh fruit. This syrup tastes like orange honey if you are a fan of oranges at all YOU MUST give this one a try! Like I mentioned earlier, the hint of orange from the zest in the waffles was just perfect to complement the syrup and the fresh whipping cream. I am definitely going to recreate this meal for the perfect Christmas brunch. Look for all of the delicious variations of Simply Orange in your local Vons refrigerated section. 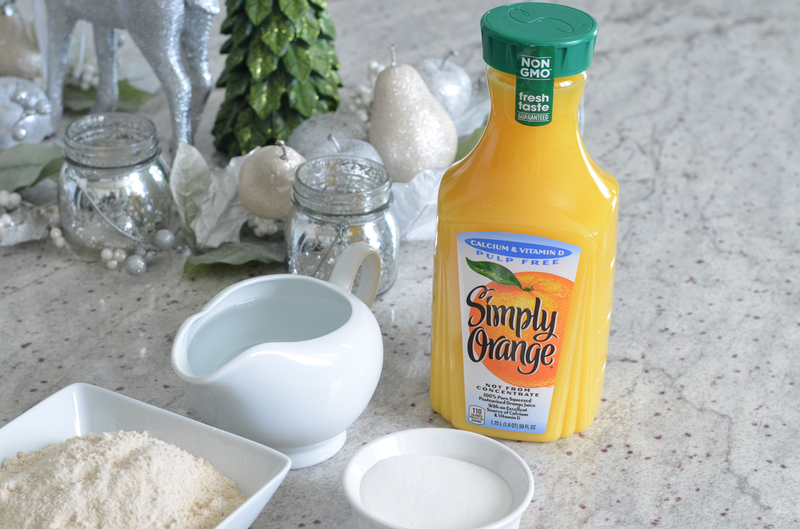 Simply Orange starts with great tasting oranges and ends with great tasting orange juice, so it tastes the way Nature intended – never with any added preservatives, colors or artificial flavors. Also, Shutterfly is offering my followers a $20 off coupon when you buy 4 participating Coca-Cola products! Here’s how it works: Offer will be executed via Catalina print out at the register with a unique pin code to redeem online HERE. Offer valid through 12-28-16. Oh yumm!! I love waffles and oranges but I’ve also never thought of combining them before, this looks delicious though, so I’ll definitely have to try it soon! Also, I’m in *love* with your tablescape! My wedding colors were light blue and silver so it’s no surprise!